How’s this for a happy new year – Counter Culture is now open 7 days a week. As of today, the restaurant is opening its doors on Mondays to participate in Meatless Mondays. Special deals are being offered the first six Mondays of 2015, including, from night to night, free bowls of soup (which we ate tonight) desserts, drinks and a steep discount on your bill if you bring an omnivore in to fill up on meatless fare. Meatless Monday is a national initiative launched by Johns Hopkins in 2003 to encourage people to eat without meat at least one day a week. The movement cites the positive impact a meatless diet can have not only on human health, but on the strength of our natural environment. FREE SOUP! 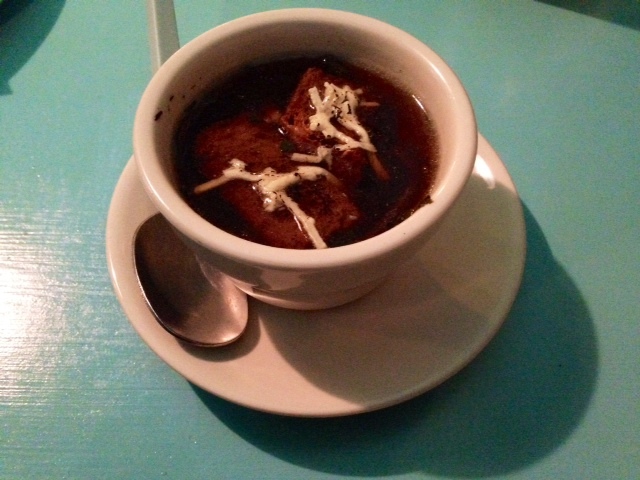 Tonight’s Meatless Monday deal was, place an order for $6 or more, receive a free cup of French Onion soup (upon request). We love the croutons in this tasty, onion-thick broth. 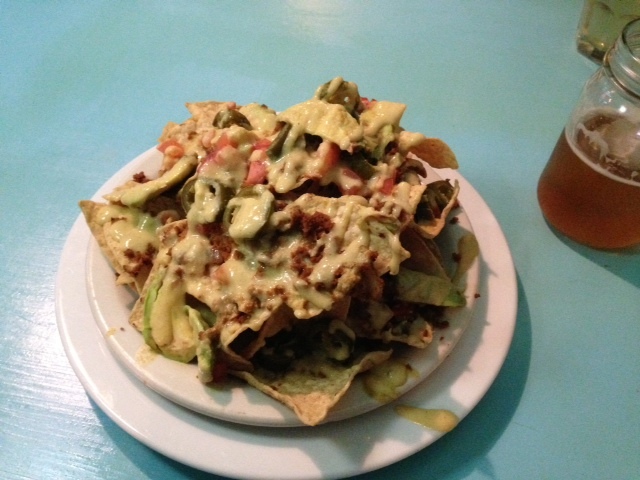 It was a solid little savory intermezzo between the nachos and the main event. Spaghetti Squash and Beatball Pizza (on gluten free crust) – This is a filling, rich pizza with a dynamite sauce. The beatballs were big enough to cut up and spread across the entire pie. Squash on a winter night is one of life’s many pleasures and should be indulged at every opportunity. The beatballs and squash combined made for a most hearty dish. Walnut Burger with some amazing greens we want to eat again right now – Let’s just start by talking about the greens; they had a creamy, melt-in-your-mouth texture and left just a touch of sweentess on the tongue. Perfect. Brilliant. A reason to live. These are good greens. The burger: this might be Carolyn’s new favorite item on the menu. Perfectly seasoned with a satisfying crunch, this patty proves that a veggie burger doesn’t have to consist of beans and mush. This is a burger to sink your teeth into. Important to note: the bun was also stellar. Cold Cutz Sandwich – Homemade, thinly sliced seitan on a long bun. The waiter was happy to replace the nut-based sauce on the sandwich with the same oat-based queso we had on the nachos. We left no room for dessert, which is a shame, because the flourless chocolate cake with coconut whipped cream was singing its siren song something strong. This meal was totally worth the traffic. We hope Counter Culture finds it worthwhile to remain open on Mondays. We’ll be starting our weeks there and hope y’all will show them some love and do the same! 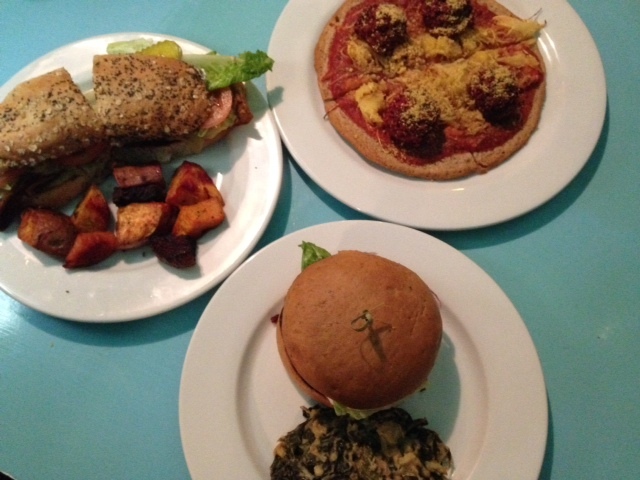 You can follow their Meatless Mondays page on facebook to keep up with all of the mighty enticing specials. Vegan Survival Guide to Austin Launch Party!